Instant Pot Taco Pie is a fun recipe to make in your electric pressure cooker, and I like having fun when I cook. Layering is fun to me (I don’t get out much). 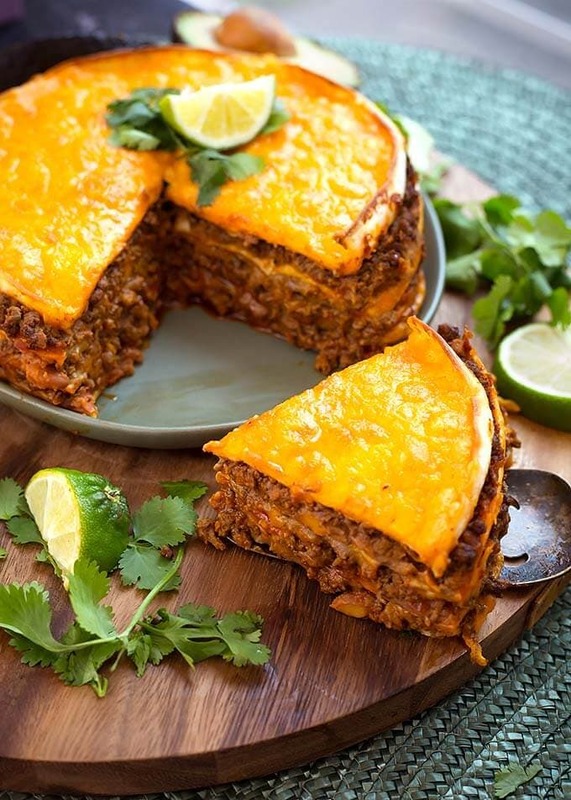 This pressure cooker Taco Pie recipe is delicious, and kid, husband, and wife approved! It still surprises me how much a 6 quart Instant Pot® can hold, as far as volume of food. I own all of the sizes, but use my 6 quart the most. When developing recipes I make them for the most popular size. Then you can scale up of down as you like. 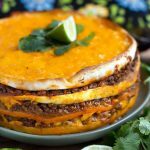 Instant Pot Taco pie is four layers of yum! You can tweak it to be spicier, cheesier, and even saucier, if you use the optional enchilada sauce (not used in the pictured dish). Anything Taco flavored and I’m on board! A good taco salad, or Cheesy Taco Pasta, Salsa Chicken, and of course, tacos! I make my own Easy Taco Seasoning, and use it for any recipe that calls for one of those taco seasoning packets. I make a double batch at a time, and love having the ability to control the salt and the heat. Try it, it’s fun to make your own! Broil at the end to get a melted, cheesy top to your delicious creation! Assemble all of the ingredients, cook the meat, and start layering. It’s fun. Even the kids can help with this part. 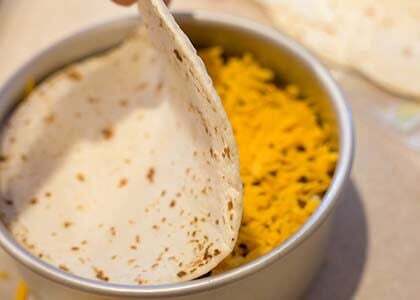 Place a tortilla in a sprayed 7″x3″ pan (springform or push pan). Then put some beans on. Then another tortilla, and repeat. Top with a final, fourth tortilla. Place some foil on the pan to keep the water out. Set the pan on the trivet with handles and set them into the pot that has 1 1/2 cups of water in it. Cook, add cheese on top and broil, and serve delicious Instant Pot Taco Pie! It’s really great how easy this Instant Pot Taco Pie recipe comes together, and with such delicious results! YUM! I hope you make and enjoy this recipe! Instant Pot Taco Pie is a fun and tasty recipe to make in your pressure cooker. 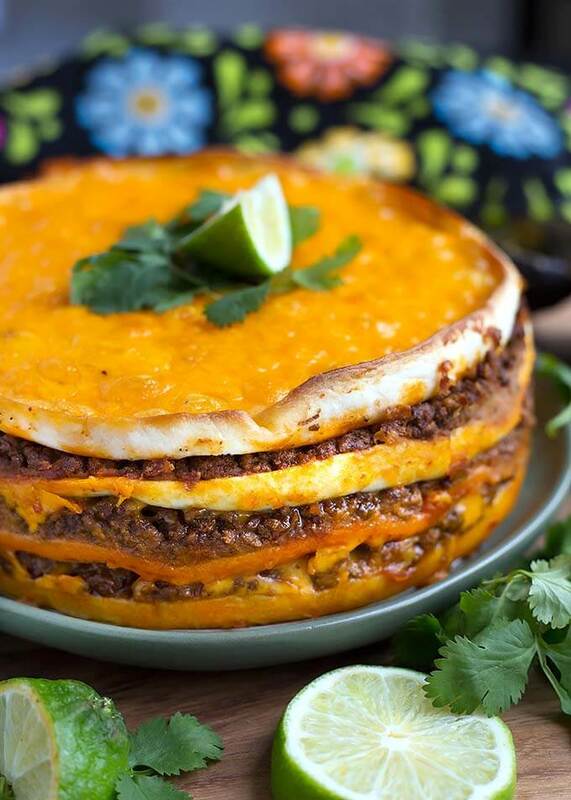 Tortillas, refried beans, salsa, meat, and cheese come together to create a layered Mexican Pie! Delicioso! Use the Sauté setting on your pressure cooker (or use a frying pan) to brown the meat, stirring in the taco seasoning in about halfway through. Cook meat until done. Set aside. Cancel the sauté setting. Wash/Rinse out the pot and put 1 1/2 cups of water in it. 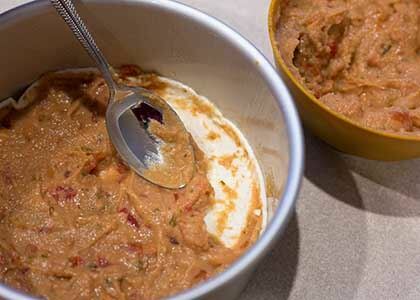 Mix the refried beans with the salsa. Spray a 7"x3" springform or push pan with cooking spray. Place 1 of the tortillas in the bottom of the pan and spread 1/2 of the refried bean mixture over it. 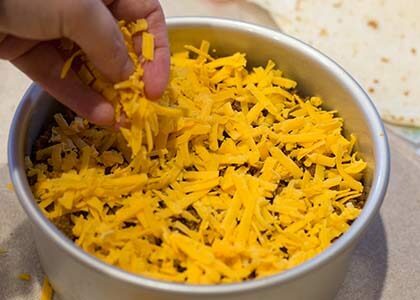 Sprinkle on 1 cup of the meat evenly, (then 1/4 cup enchilada sauce, if using) then 1 cup of the cheese. Place a second tortilla in the pan, then 1/2 cup of the refried bean mixture, 1 cup of the meat, and then 1/2 cup of the cheese (the first layer has 1 cup, that is correct). Place a third tortilla in, then 1/2 cup refried bean mixture, 1 cup of the meat, and 1/2 cup of cheese. Place the final tortilla on and gently press in place. 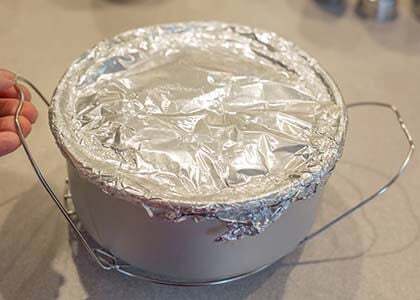 Cover the pan with foil and place on the trivet/rack, and use the handles to place them in the pot. You can also use a sling, and set the pan on the trivet that you will put in the pot first. Place the lid on the pot and lock in place. Turn the steam release knob to the Sealing position. Press the Pressure Cook/Manual button (or dial) and use the + or - button (or dial) to choose 17 minutes, and High pressure. When the cooking cycle has ended, let the pot sit undisturbed for 10 minutes (10 minute Natural Release). Then turn the steam release knob to the Venting position to release the remainder of the steam/pressure. After the pin in the lid drops, open the lid. Use silicone mitts, or oven mitts to carefully remove the pan and trivet. If you used a sling, gather up the two ends of the sling and carefully lift out the pan to a cooling rack. Be very careful as the pan and the water is hot. Turn on your broiler to 450 degrees (F). Remove the foil from the pan and sprinkle on the remaining 1/2 cup of cheese (or more, up to 1 cup). Place the pan on the middle oven rack and let the cheese brown to your desired amount. Don't leave it unattended as it could get too brown if you don't watch it! Remove from oven to a plate and let it sit for a few minutes to set up and cool a bit. Run a butter knife around the edge to loosen it. Carefully unlock the springform pan and lift the ring off. Use a spatula to slide pie off of the pan bottom, or just leave it and serve from it. 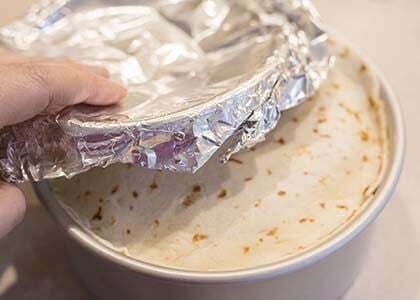 If you used a push pan, loosen the edge with a knife, and set a large can on a plate and set the pan on top of the can and gently push downward. The pie will be sitting on the pan bottom. Very carefully slide the pie onto another plate and serve from there. Use caution as it will be hot. Cut pie into desired serving sizes and garnish with your choice of sour cream, salsa, lime wedges, chopped cilantro, etc. 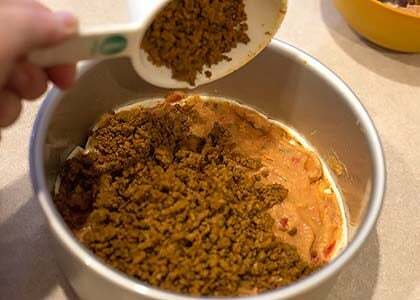 I used ground turkey, a homemade taco seasoning, a can of Old El Paso refried beans and no enchilada sauce. I followed your recipe as written. It was excellent! Luckily there are only two of us and there are left overs. Hi Rose! I love using ground turkey. It is nice how it is interchangeable with ground beef. Thank you for your review, I’m so glad you liked this recipe! I have made this twice and we just love it ….I usually make my own refried beans and use a vegetarian ground “beef….I also make your taco mix and I will never buy other package seasoning again fabulous ? Stephanie with the veggie ground, do you sauté it or just use in recipe cold? This was a real winner. I’m just learning to use my Instant Pot, and made this last night. It’s deceptively filling. Will definitely make this again. Hi Stefanie! I told my husband the same thing, because he took a large portion the first time I made it, lol. He couldn’t finish it! Thank you for your review, I’m glad you like the recipe! I made this over the weekend and it was great. However, the second I pulled the spring form pan off, it oozed out into a mess. Any ideas why? Was it supposed to sit? Hi Frank, the three things I would look at are 1) Are the beans very wet? and 2) Is the meat very wet/moist? 3) Are you using the full amount of cheese? If you are sure it’s not any of these three things, then I would let it sit for a few minutes after broiling. I’m glad you liked it, and I adjusted the instructions to mention letting it sit a few minutes. Couldn’t hurt! Had planned to make this for dinner tonight. It’s Taco Tuesday!! Soooooo disappointing to discover that my standard Pampered Chef springform pan does NOT fit in my 8 quart Instant Pot. I measured and it’s 9.5” instead of 7”. I’m sooooooo sad. I’m going to make it in the oven. Wish me luck! ? Nooooo! Darn it! I’m sorry to hear that. I hope it turns out okay. It should! I absolutely love this recipe!! It looks and tastes delicious!! I would love to see more recipes from you… Loved it a lot? Hi Meli! I’m so happy that you like the Taco Pie recipe! It’s fun to make, isn’t it? Thank you so much for leaving your review! I’m so glad I found this recipe. I was worried on the pan size, as my spring pan is only 7.5 by 2.5, but after packing it down a bit I managed to get all the layers! I used ground chicken and the green Restaurante flavor taco seasoning from the store. I garnished it with sour cream and chopped green onions. Everything came out amazing. Even my husband who is not a fan of Mexican food gobbled this down. No leftovers and my family is always begging me to make it for dinner. Thank you! That’s wonderful, Eva! Thank you so much for letting me know! 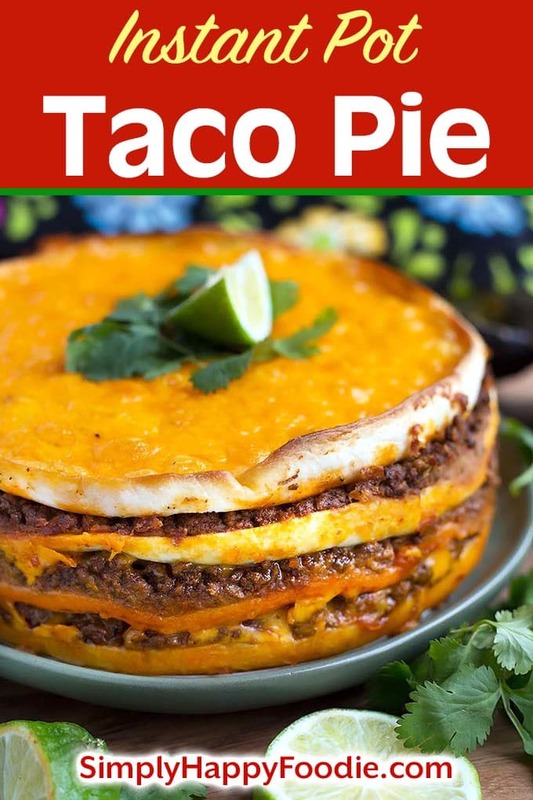 I’m so glad you and your hubby liked this Taco Pie Recipe! Can I use corn tortillas? Sure! It may be more fragile, so you might use 2 per layer. I want to make this in the oven. Any idea on how to go about it? Hi, Layer the ingredients in a 8×8 baking dish. Bake at 350° for 30-40 minutes. Hi, I am new to the IP world and don’t have a spring form pan yet. I wanted to try this recipe for dinner tonight and saw your oven suggestions. This is probably a silly question, but does the ground beef already need to be cooked at that stage, or does the 30-40 mins include the beef being raw? Also, what are your thoughts on adding tomato inside of the pie? Hi, Yes, the meat needs to be cooked first. You can add tomato, it may make the pie a little more loose, but it will still taste good! Thank you so much! I made it for dinner this evening and it was a huge hit!! recipe easy. i like trying different ones. yes try half hamburger half ground turkey. I use mine everyday. do canning. Can do This recipe in the oven? I think so. Try 350° for 35 minutes. This was a hit with my family. I used a diy taco seasoning mix. I spread the bean mixture on the tortillas before putting them in the pan, a tip that made that part a bit easier. The pie collapsed a bit so I’m thinking I removed the springform a few minutes too soon. The recipe came together quickly and my extra liner came in handy. Made this omitting refried beans as family does not like them. Added a pinch of crushed red peppers to the taco meat for a little kick. Family loved so much I had to immediately make a 2nd one that was also ate immediately. I used ground Turkey. Best recipe ever!! Thanks. That’s great, Michelle! I’ve been craving one in the midst of all the Holiday food, lol! Thank you for your review! This looks delicious, but do I HAVE to use the spring board? It can I just layer it in the pot? I don’t have a spring board yet! Thanks for the yummy recipe. You do need to use some kind of pan to hold the Taco Pie. Water will be in the inner liner of the main pot to create the steam that builds up to pressure to cook the food. If you have an oven safe dish that is about 7″ in diameter (for the 6 qt pot), you can use that and set it on the trivet. We really liked this. I think there is a slight mistake in step 4. I think it’s supposed to be 1/2C refried beans not just 1/2 refried beans. Hi Kelly, I’m glad you liked this recipe! I could not find the error, as I see 1/2 cup refried beans. Do you still see that in step 6? Thank you. Came out great!! I would suggest draining the ground beef before adding the seasonings to it. Also, I added a diced onion to the ground beef and it came out great! I made this tonight (minus the salsa and enchilada sauce) It was yuuuuuummmmmmy. Thank you! I was skeptical but with all the great reviews, I had to try it. Turned out delicious. The only thing I noticed is that it really wasn’t that warm, probably because I let it sit too long in anticipation of trying to ensure it didn’t collapse. At any rate, Individual slices can be heated in the microwave and it tastes great. I will definitely make this again. Thank you for sharing! Thank you, Glinda. One tip for keeping it warm is to let it sit in the oven after you have turned off the broiler. Let a good bit of the heat out first so it is not too hot. Leave the door ajar, and it will stay nice and warm! I made this as written, except I put sour cream and lettuce on the very top instead of cheese. Hubby loved it and said he wouldn’t change a thing. It’s a ten!! Yummy! Thank you for the tip. I’m so glad you liked this recipe! Made this last night for dinner. The only problem I had was that it didn’t make enough! My family LOVED it! Thank you for sharing! That’s great! If you get a taller pan you can squeeze in another layer!